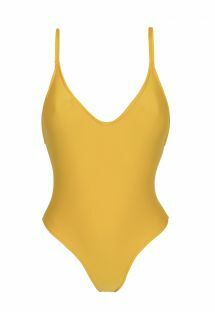 With their sunshine colors, our yellow bikinis show off your silhouette at the beach or riverside. You’ll fall for the swimsuits with stylish prints or models enhanced with decorative accessories. Yellow is definitely the color of the season. A yellow bikini will show off your tan, or make you shine if haven’t gotten there yet! Whether you are blonde, brunette, or a redhead, this trendy color is synonymous for joy! Discover our selection of Brazilian yellow bikinis, they are both elegant and comfortable.